I am an Asian who lives in America for ten years yet I am still craving for Asian foods. My husband teases me every time why I cannot live without rice. I told him that I eat rice for 28 years before coming to America. He has no choice but to accept the fact that his wife is Filipino by heart. Unfortunately Asian store is at the city of Buffalo. I always get lost going home. I am driving with my GPS yet it is not working. There are two Asian stores in the city but this store is my favorite. You can find everything you need. I often buy rice, dried fish, sardines, soy sauce, fish sauce and anything that I can think of. My little K was with me during that shopping. Guess what she said when she is in this picture? She asks me, Mommy why is it stink in here? She is one funny Filipino-American girl of mine. She was not feeling well in this picture. Yet! She let Mommy take a picture of her. I am linking this entry to Tuesday Travels. 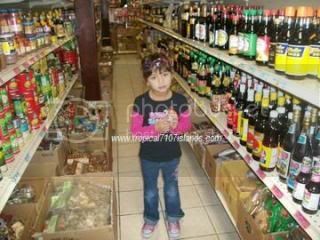 This entry was posted in city, food, gadget, shopping, store and tagged Asia store, Buffalo, dried fish, GPS, grocery, rice. Bookmark the permalink.